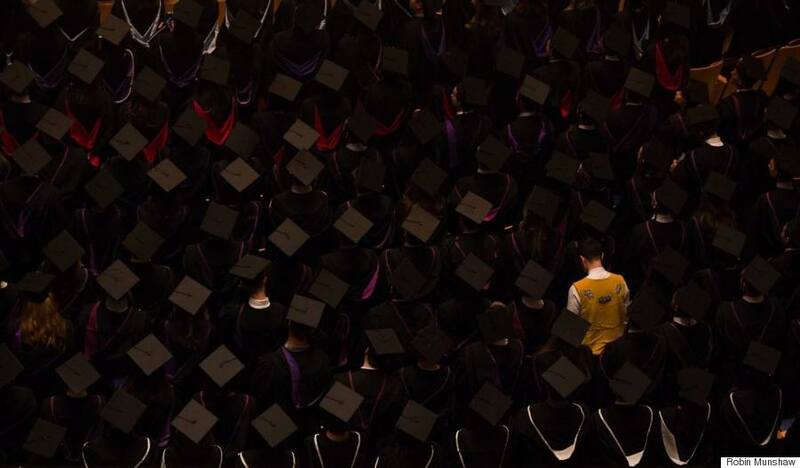 This Student Didn't Wear A Gown Or Cap To Graduation. Here's The Incredible Reason Why. His answer will warm your heart. Stephen Mussell was a splash of tan in a sea of black robes. The 26-year-old Plains Cree/Métis student, who graduated with a Juris Doctor from the University of British Columbia (UBC) on April 20, decided to forgo common graduation attire and instead opt with tradition. "I would like to pretend that I was confident and fearless, but I felt quite nervous," he says. "I was the only one out of hundreds of students not wearing the cap and gown, and the thought of walking across the stage in front of everyone was a bit frightening." But this photo, which was snapped by Robin Munshaw, definitely made him stick out. He wore a tanned deer hide beaded vest made by his girlfriend Samantha Dawson's mother, a gift he received as a graduation present. "Samantha's family is Tlingit and Northern Tutchone, and the vest was made in the Northern Tutchone style." He also wore beaded moccasins from his mother, a quillwork bolo tie from his father, and carried an eagle feather that was given to him by his nohkom (grandmother) for courage and strength. Mussell believes the photo was taken when students were welcomed to the territory by a Musqueam elder. UBC is located on the traditional and unceded territory of the Musqueam people. And on the stage, another elder and former UBC student Leona Sparrow, was also there. "I spent much of the time watching Leona, thinking of Judge Alfred Scow [the first Indigenous person to graduate from UBC Law], and the other Indigenous people who made it possible for us to attend law school," he says. "It was not long ago that Indigenous people weren’t even allowed to hire a lawyer, let alone be one. Thinking of those courageous leaders who led the way, that got me through." So fortunate to share such a happy day with this amazing woman. When he had arrived to school that day to the stage area and other students picked up their gowns, he told the administrator he wasn't wearing one. "She didn’t object, and I went to stand with my fellow classmates. No one required that I justify my choice to them." Graduating with a specialization in Aboriginal law, Mussell says he chose this career path because he feels the laws of Canada continue to be fundamentally unfair to Indigenous people. And as a graduate, while he hopes to work towards improving the lives of Indigenous people generally, not wearing a gown, for example, is one way to show his grounding for his roots. "The cap and gown are referred to as 'regalia' and are worn to maintain an academic tradition that is centuries old. I wanted to wear the regalia of our people, and to celebrate the thousands of years of Indigenous knowledge, laws and traditions that I value above all else."